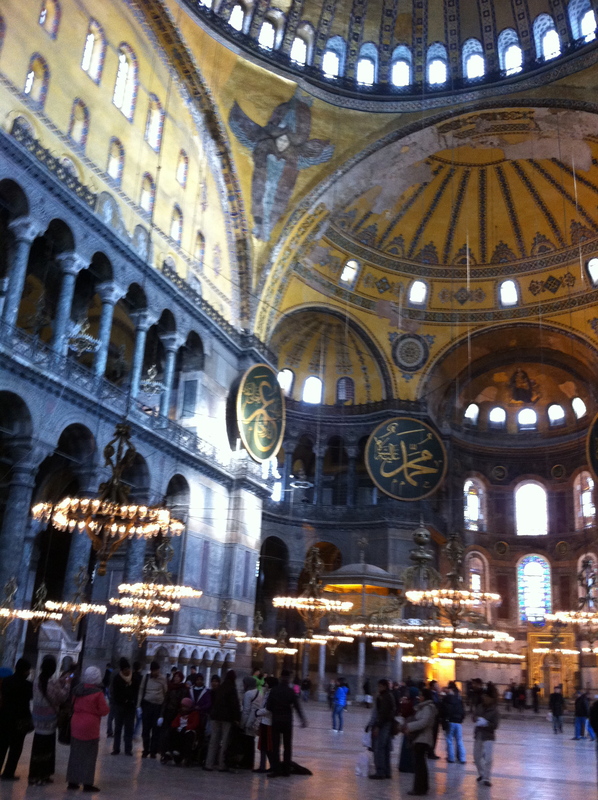 The Hagia Sophia (Holy Wisdom), a former church and a former mosque where Christian and Islamic symbols exist side-by-side. “Whoever gives you a cup of water because you bear my name will not lose their reward” Mark 9:41. I received some of the warmest hospitality I have ever experienced from Muslims in Turkey. We saw the sites–Hagia Sophia, Blue Mosque, Ephesus, Cappadocia–but we also spent time in people’s homes. We ate at their tables, food that they prepared for us. Good food. No, spectacular food. And they received our questions about their lives with grace and openness. And they were eager to learn about our lives as well. In addition to visiting in people’s homes, we also visited with a newspaper editor, a hospital administrator, the dean of school of theology at a private, Islamic university, and with people in business. We saw what they showed us, so we got a particular view of Turkey, one designed to leave us impressed. But we saw more than most visitors see. And we were impressed. The great city of Istanbul is divided by the Bosphorus Strait, a waterway that divides the continents of Europe and Asia. One side of Istanbul sits in Europe, the other in Asia. This geographic particularity symbolizes Turkey’s importance in the world. It possesses a unique place, mediating many cultural factors, and holding together many tensions. The people we met with were very aware of Turkey’s importance in a world of conflict. And the Muslims we met with were particularly interested in creating and maintaining a culture of openness and respect among the various religious communities in Turkey. They don’t want radicalized elements of Islam or any other faith to characterize an approach to the world or to the other that is exclusive, closed, and antagonistic. I had great conversations with my hosts about Christian beliefs. They were particularly interested in my understandings of the Trinity. And they were fascinated by the diversity of literature and perspectives held together in the Christian scriptures. They were grateful to have a more accurate perception of the Christian faith, and even about how that faith functions in American society. I, in turn, learned much from them about how they viewed their faith and their place in the world. And so, as I prepared for my sermon from Mark 9 this week, I couldn’t help but think of their hospitality, their interest in making me feel welcome precisely because I bore the name of Christ. May they not lose their reward. This entry was posted in culture, theology and tagged Christian, dialogue, hospitality, Islam, Muslim, peace, understanding. Bookmark the permalink. Thanks, Don. Slow down on the autobahn! Susan, the lights are just fixtures that hang from long wires. They used to be for candles for those time the natural light was not enough.